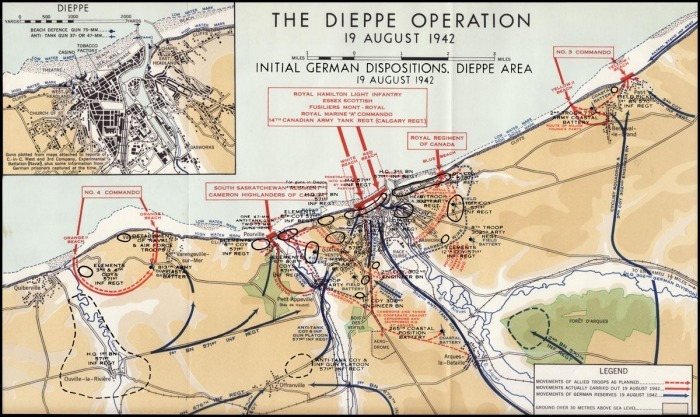 This page covers tours to Dieppe in Upper Normandy, about 200 km (120 miles) north east of Bayeux, where the Raid on Dieppe took place on August 19th, 1942. There is a short description of the places and sites to see at the top of the first section, with more detailed explanations of the history and where the sites you want to visit fit into the overall battle. 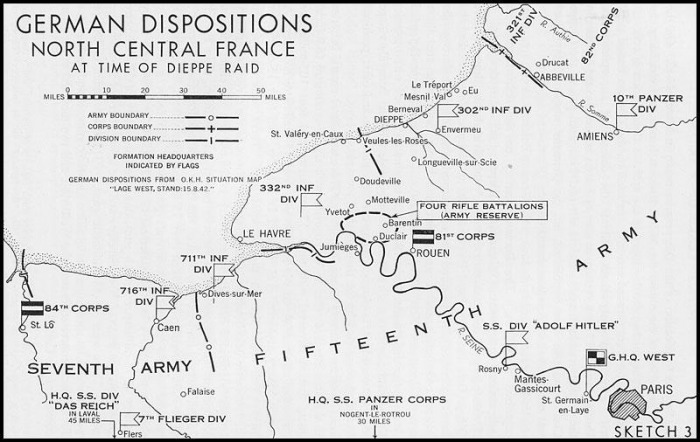 The furthest battlesites apart in the area covered by the Raid on Dieppe are all within about an hour's driving of each other. The list of sites to visit below is not a complete list of all of the places you can visit and if there is somewhere off-list that interests you, please do not hesitate to ask. 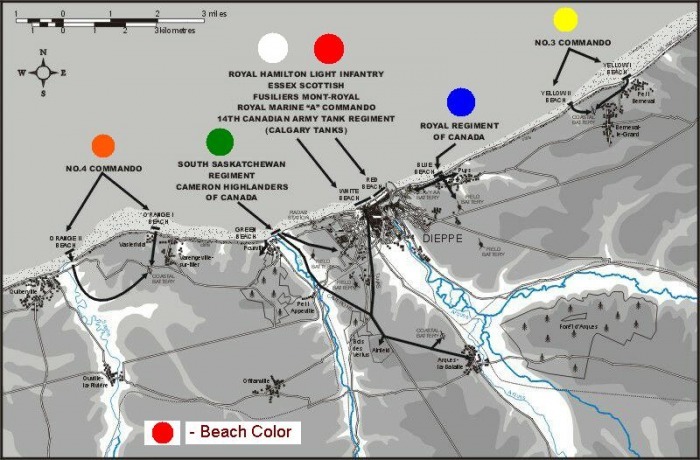 Operation Jubilee was the attempted landing of the 2nd Canadian Infantry Division on the 19th of August 1942 at Dieppe on the coast of France 100 miles north east of the D-Day Landings nearly two years later. This landing was carried out mainly owing to political rather than military pressure. 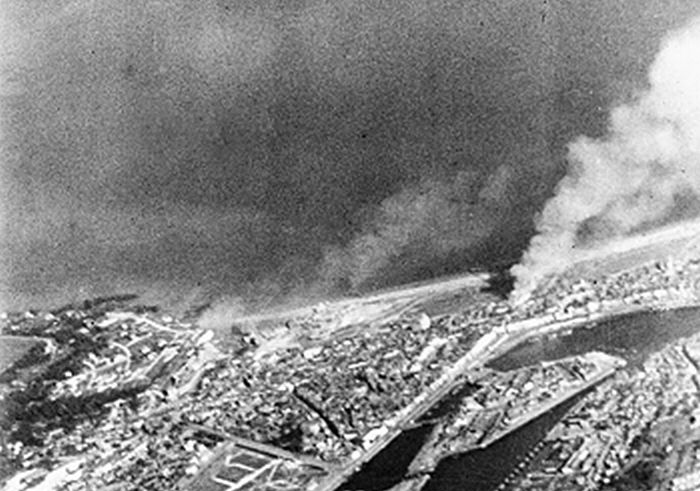 It was intended to seize and hold a major port for a short period, both to prove it was possible and to gather intelligence from prisoners and captured materials while assessing the German responses. The raid is generally considered to be a near complete disaster, with few objectives achieved and over 4,000 of the 6,000 men who made it ashore becoming casualties. Here there is to see the German Bunkers and positions set into the cliff at the eastern-most point of the landing zones, Yellow beach. The ships transporting the men of No. 3 Commando had run into the tail end of a German convoy on the way in and several of their crafts had already been sunk. Only 18 men of this assault force made it in to engage the enemy. At Blue beach, 6 miles further west, is the site where the Canadian soldiers found themselves under very heavy and accurate machine gun fire, only 33 men out of the more than 500 who came ashore there making it back to England. 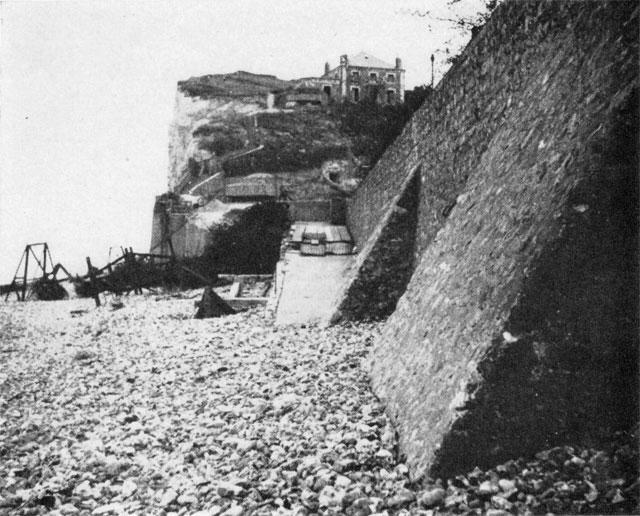 The town of Dieppe itself, where the main assault took place but none of the 29 tanks put ashore made it off the sea-front and the soldiers not much further. On Green beach two miles further west where the Victoria Cross was awarded to the Commanding Officer for his self sacrificing bravery while organising the defence of the beach to allow the evacuation of his men. And Orange beach, the most westerly of the beaches where No. 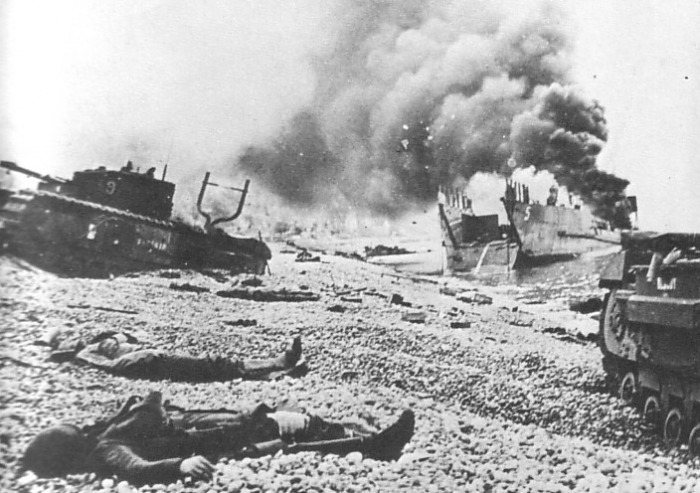 4 Commando under Lord Lovat came ashore and carried out what was probably the only properly successful assault of the Dieppe Raid where the Gun batteries of Varengeville were captured and their guns destroyed before the Commando’s withdrew, suffering only 45 casualties in all. There is also the Canadian cemetery of Dieppe where nearly 950 soldiers lie buried, most of whom died in the raid of August 19th, 1942.